If you wish for a break from the chaos of the city, step inside the largest green space of Paris, named Parc des Buttes Chaumont. This quirky park has landscaped slopes with caves, a lake and an island with a temple of Sybil. As you climb up the slopes, you get a glimpse of the park’s history and its relation with Napoleon III. Climb up the hills to witness a great view of the city. Walk down towards the streets below the park. You will come across a local cafe where you get the taste of perfect traditional French ambience with a French pastry and a drink to accompany you. Sit for some time to enjoy the surrounding view. Accessibility for disabled people are confined to certain region. Timings are subjected to change. Check the website before the visit. Love this? Explore the entire list of places to visit in Paris before you plan your trip. Fancy a good night's sleep after a tiring day? Check out where to stay in Paris and book an accommodation of your choice. 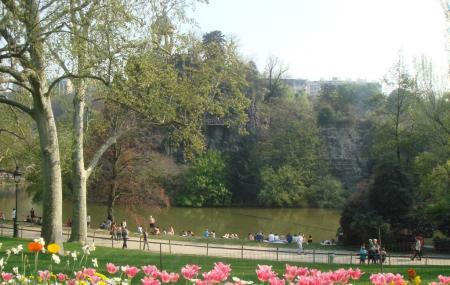 How popular is Parc Des Buttes Chaumont? People normally club together Musee Picasso and La Madeleine Church while planning their visit to Parc Des Buttes Chaumont. Really interesting place, not your average boring city park but this one has caves and looks very exotic. I enjoyed walking here and it was peaceful. Magnificent park away from the center of Paris. he is very huge. Highly. It amazes with its beauty and landscape differences. Many beautiful trees, shrubs and landscape solutions. At the highest point of the park, overlooking the whole of Paris. Great place to have a good time. Just do not regret visiting. Stock up on provisions and to rest. Very awesome park. Amazing what the height difference is for a city park. It was really good weather, so the park was jam packed with good vibes all over.